Tofu and pork are perfect partners. 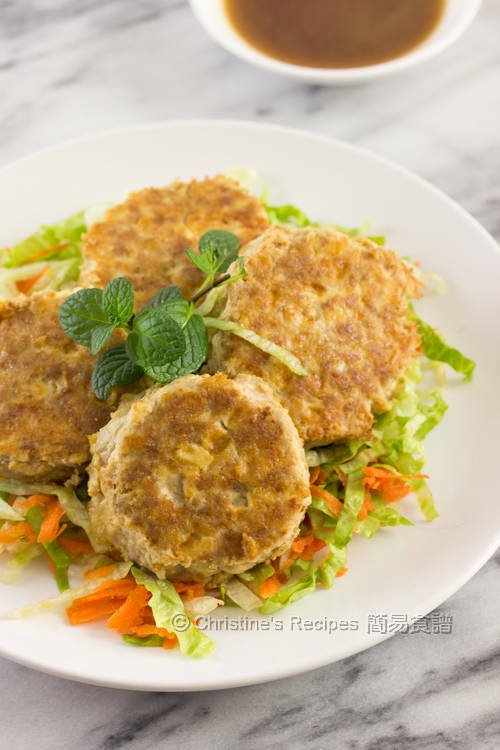 As for this dish, the tofu, adding a refreshing note, helps turn the pork mince patties even more tender with moist. On the plate, a bed of crispy and crunchy lettuce to balance the texture will make you feel like never having enough of those pan-fried patties. Each bite of it that dipped in the delicious sauce will make your taste buds dance. Both my hubby and I found those four tofu and pork meat patties are really not enough. I have to double the portion when I make this dish next time. Wipe dry the tofu with kitchen papers. In a large mixing bowl, stir to combine the pork mince, tofu, egg and marinade very well. Chill in fridge for about 30 minutes. Remove the tofu and pork from fridge. Divide into 4 equal portions. Roll each portion into a ball shape and flatten into a disc with your palms. Heat oil in a non-stick pan. 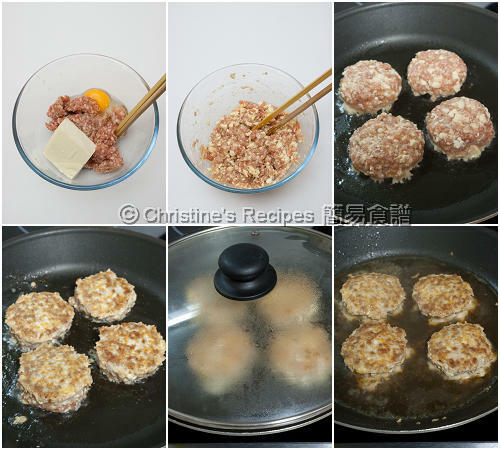 Pan-fry the tofu and pork patties until both sides are lightly brown. Cover and continue to cook about 4 minutes. Remove the lid and pour in the sauce. Bring it to boil. Done. 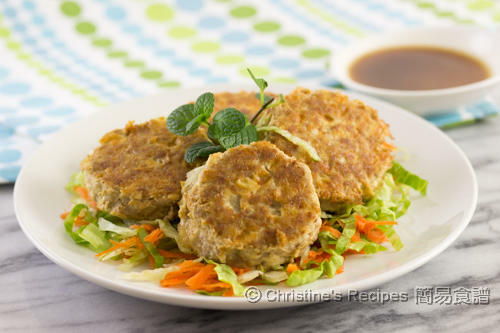 Serve the fried patties hot on a plate with a bed of shredded lettuce and carrots. Pour sauce on top, or serve on the side for dipping. By chilling the tofu and pork mince mixture, it helps the pork absorb more water and the marinade. Beware not to dry up the sauce. Once it boils, it’s done. The salt intensity of fish sauce is different from brand to brand. Please adjust the amount accordingly. I used Three Crabs brand fish sauce. On the cooking method, do you really pour the sauce into the pan (as you finish up frying the patties)? Won't they be soggy or is it meant to be that way? The patties won't be soggy as you would like them moist. And we don't need to cook them for a long time. Just bring the sauce to boil, then dish up. Do the patties need any seasoning? These do look delicious, but I would be tempted to put in some salt and herbs. If they don't need it I don't want to ruin my first batch. Or does the sauce make up the need for seasoning? thanks! Yes, the marinade listed in the recipe is seasoning actually. Got salt there already. Feel free to experiment and add some herbs if you like. My husband eats lots of pork patties and using tofu in them is definitely one great way to cut down some calories. They look fantastic! Can I use minced chicken instead of pork? Will the cooking time be different? Thanks for sharing! Sure, minced chicken is good choice too, going very well with tofu. Tried this, its so moist. My 1.5 year old likes it. I love the sauce too. Thanks Christina for sharing the recipe. Can't wait for your 2nd cookbook. If I publish my 2nd cookbook, I'll sure let you all know. Keep coming for more yummy recipes. Hi Christine, can I use silken tofu instead? Will it not taste better? The taste will remain the same. But the silken tofu is quite watery and will make your patties too soft. Love water chestnuts too, adding more crunchy texture into the patties. Good idea. Can replace tofu with 豆干? I'm afraid that 豆干 won't work for this recipe due to its hard and dry texture compared to tofu. Hello, can this be made into soup meatballs instead? And if we fry them, will the airfryer work? Guess that it'd work for soup, although I haven't tried before. Hi Christine, I tried this recipe and my family likes it. My son loves the sauce, and the taste blends very well with crispy and crunchy lettuce. Will try it again. Thanks for your easy and wonderful recipe! Glad that your family liked it. Thanks for your comment. Very encouraging. Can I replace the fish sauce with any other sauce? The taste of fish sauce is very unique and add a subtle umami flavour to the whole dish. I can't find anything that can substitute it. If you don't have it at hand, you may skip it. Can I make the patties a day before and pan fry it the next day? Be sure keep them well in fridge. The tofu and mince pork will turn bad very quickly. If you cook them first, then will keep longer. Just reheat them to serve. Hi Christine, I cannot do frying at home, do you think I can bake these instead? thank you. Sure, you can bake them instead. But make sure not to burn them before they are cooked through. Hi Christine, can I use egg tofu instead of firm tofu? Sure, you can use egg tofu. No problem at all. Hi Christine, this recipe looks really good and easy to make. I am allergic to fish and seafood including fish/seafood based sauces. Can the fish sauce be replaced with other sauce? If I omit the fish sauce will it change the taste? Many thanks. The fish sauce will make this dish taste wonderfully delicious. But you can omit it or add a bit of soy sauce instead. Tried this recipe for dinner the night before, and it's really delicious! Thank you for this recipe! Very glad you liked it. Thanks for letting me know. I've tried a large batch and cooked some to keep in my freezer. It's quite handy whenever you need them, warm them up again. Thank you for the recipe, may I substitute pork with fish instead? I haven't experimented with fish to make this dish. I think it'll work with fish too.